When I moved to NYC in 1997, Brooklyn was where you lived if you couldn't afford Manhattan. And at the time, apartments on Manhattan's Upper East Side were so expensive, I didn't even look at places in the neighborhood. However, I was dead set on living in Manhattan, and ended up renting this tiny 200-square-foot apartment on West 72nd Street, eventually moving to a similarly-sized apartment two blocks away. The prices were right, and even though space was basically non-existent, I loved the location right next to Central Park. Now, however, Brooklyn is where all of the cool kids live. When Scott and I bought our apartment in 2012, our new neighborhood on the Upper East Side had become the "affordable" area. It now attracts recent college grads and hipsters who have been priced out of Brooklyn. Go figure. Since I am nowhere near cool enough to live in Brooklyn anyway, I settle for the periodic visit. So, I was excited to hop on the Q train last week to head down to Sunset Park for the grand opening of BEYOND at Liberty View, a new shopping and dining destination in an industrial area along the waterfront. This is the kind of place you can only find in Brooklyn. I love the industrial look, complete with the concrete floors and columns. This "living room" at the Cost Plus World Market is about the size of my entire first NYC apartment - but it's so gorgeous I may just ask Scott if we can move in. Have I ever mentioned how much I love throw pillows? It may have something to do with the fact that they have always been an easy way to switch up the decor in tiny apartments. Scott is fortunate that I did not scoop up all of these, load a truck and bring them home. The complex also includes a Bed Bath & Beyond that carries more coffee machines and mugs - and coffee and tea varieties - than I have ever seen under one roof. Maybe I can snag a few of these for the TV segments I do for them this summer! I could not get out of here without buying something; I had been in the market for espresso cups for oh, about a year - so our kitchen cabinet now houses one of each color of the Le Creuset espresso cups pictured here (urban shopping tip: espresso cups are easy to carry home on the subway). Not sure anyone in New York City has room for this machine in their apartment - but if you do, rest assured that I did not buy it. It's still there - and waiting for you to take home. Adding to the local feel are "Born in Brooklyn" sections dedicated to local products, along with dining options that include locally-sourced coffees, craft brews, wines and other menu options. Since I can be door to door in about half an hour, I'm planning to get Scott out there with me soon. 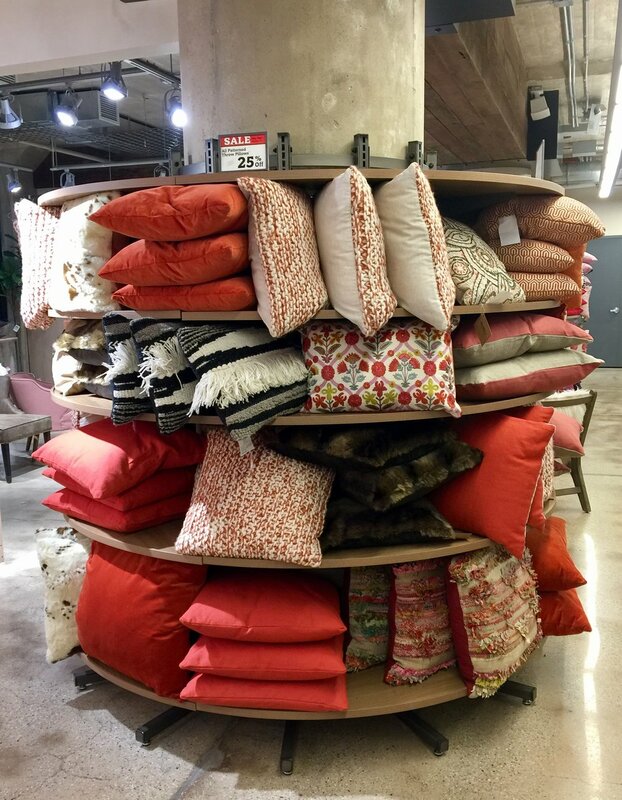 Maybe we'll even pick up a few throw pillows for our sofa. How do you like to change up your decor? New paint? Art? Let me know if I am the only one obsessed with pillows!